Want a magic coin trick that doubles as a science experiment for kids? 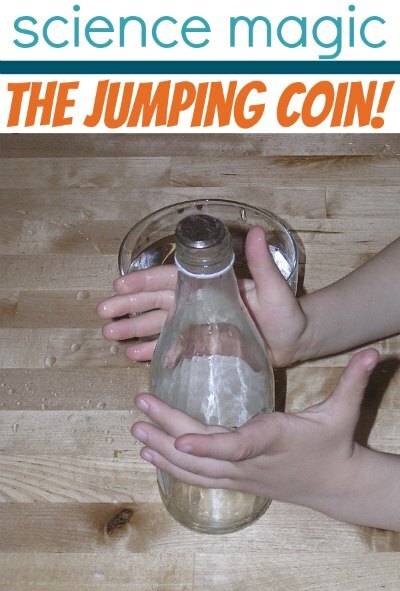 Try The Magical Jumping Coin! It’s simple and fun. First chill a glass bottle and a coin by placing them in cold water. Place the coin on top of the bottle. Wrap your hands around the bottle and wait. The coin will jump up off the bottle! The reason is that the warm air created with your hands pushes upward with more strength than cold air, making the coin jump! For younger kids, the experiment itself doesn’t provide hours of entertainment, but a bowl of water, a coin and a bottle do! We did end up with a wet table, though. Good thing cloth diapers are very absorbent. Thanks for the science link…hadn’t seen that one and will check it out. I wonder if the experiment will work with other coins? Do you need to just a plastic bottle or a glass one? Looks fun. I’m limited to time on the net as I’m doing the “turn off week”, no television so far, easy, but the net is a hard habit to kick. I tried it with a plastic bottle, too. It seemed to work better with glass. Looks like an interesting one! Though I think my kid would enjoy the water play best, too! I’m always looking for good, easy science experiments to do with my kids. This one looks great! Awesome! I’m pinning this one to use in our preschool co-op this year! I’m going to give this a try. Thanks.